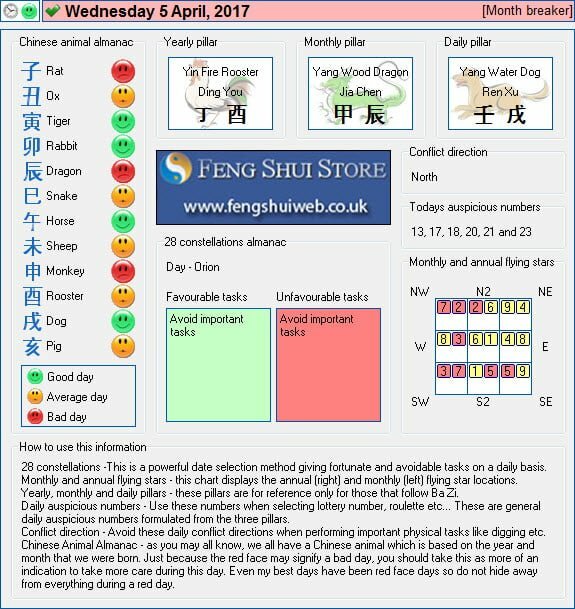 Here is the Free Feng Shui Tong Shu Almanac for Wednesday 5th April 2017. I have to dig in the front yard, I can’t wait. Unfortunately this area is NW… Would one of your 6rod metal wind chimes hung on the home, between the yard work, be enough protection? Would a salt water cure on the porch help? Any other suggestions? I would make sure you place a 6 rod chime where the work is being carried out and also carry the work out in May if it can wait as an auspicious visiting monhtly star enters the northwest for the month. Thank you. With the way our luck has been, we rescheduled the work for May. Will get the wind chime. Appreciate the feedback.